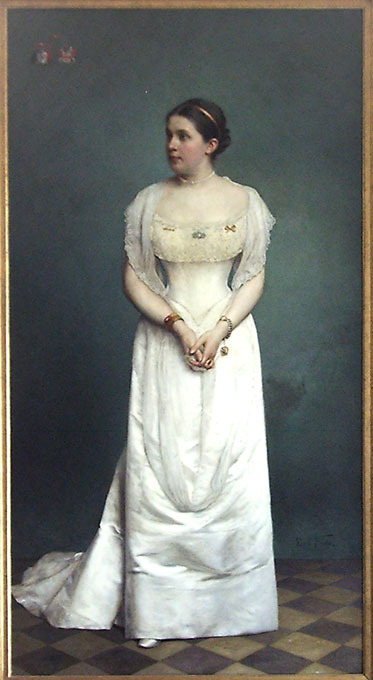 Some time ago I was captured by a marvelous portrait of Agnes von der Groeben, and now – I have “stumbled” upon another remarkable woman from this land. Well, during our short holiday in Galiny (Galingen) – we went to Kętrzyn (Rastenburg), as I wanted very much to see the tomb banner of Botho Zu Eulenburg. The tomb banners were popular in the 17th century and later. Not many of them survived – as the material is not resistant to time and… wars (and those were numerous here throughout the history). What a pity we did not stop there! And then, a standard history of these areas swept through here. Namely: the Teutonic Knights and their new orders. Castles, manors and firstly the fortified churches were built in these lands. The newly built churches were often placed on the former (pagan) worship sites. And so it was with the church in Garbno. It was built on a hill, probably on an ancient place of Bartian worship. 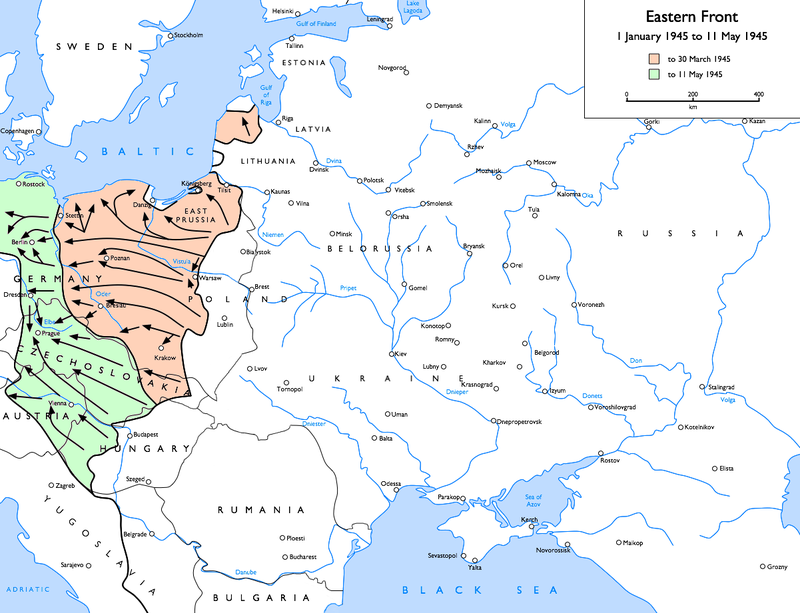 See the map of the Prussian tribes (clans) in the 13th century. The castle is not preserved – as it was destroyed during the Thirteen Year’s War . Of course the new propaganda wanted and had to tame the place, so they made a legend about the lamb appearing at the same time and in the same place. Whenever it was caught – it escaped miraculously just to appear again in harvest time… So the church was built in the place of the lamb’s appearance. We must however remember that the place was give to the free Prussians. Contrary to the popular belief, the Prussians were not exterminated by the Teutons. The were assimilated probably more or less in the 16th or 17th century. 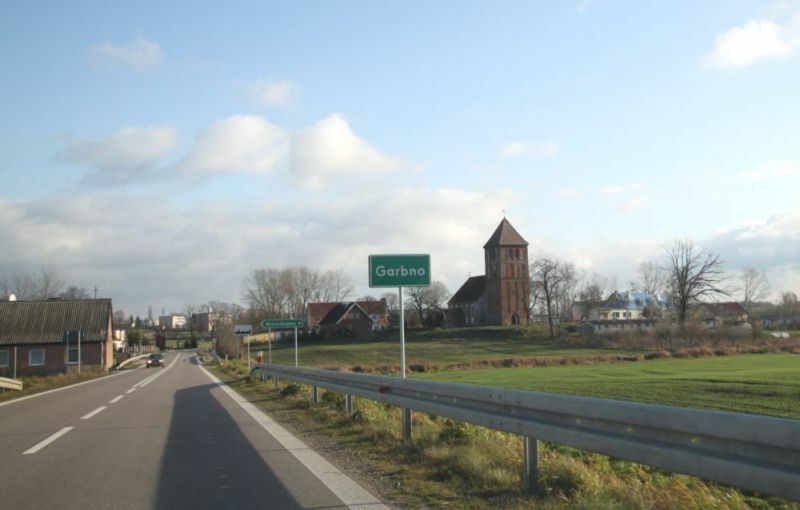 In the 13th century a village was founded – today’s Garbno – based on the Kulm Law. And then, as it often happened here – the history changed its course. In the beginning of 1521 the then Teutonic Grand Master – Albert handed ca. 14 włóka (włóka means today’s 17,955 ha, or ca.44,4 acres) of land in Garbno to Heinrich von Egloffstein. And the village stayed in the hands of this family until 1832. However – probably the village was leased to a von Buddenbrock family while the Egloffsteins lived in their palace in Arklity (Arklitten). Here at the beginning of 1810 Gustav von Buddenbrock was born. Later he became a Prussian army officer and a Knight of the Order Pour La Merite (for participation in the Franco-Prussian War). In 1832 Garbno gets a new owner, a Christian Bierfreund. After a few years – the property goes into the hands of Lieutenant Konrad von Redecker, who in 1856 sold it to Edward Krause. (The Redeckers are connected with the wonderful palace in Nakomiady – formerly Eichmedien. In 1880 the property was handed to Otto Boehm of Głowbity (d. Glaubitten). And this is where I “stumbled upon” the aforementioned remarkable woman. Otto received the property from his father on the occasion of his wedding with Miss Elisabet Steppuhn of Łękajny (Landkeim). Elisabet founded the first in Germany Village Women’s Union (22.02.1898r.). The main goal of this Union was primarily education of village women and enabling them to exchange experiences. This was not all, as the Union also dealt with distribution of preserves. Elisabeth was the organizer of the school network for women throughout Germany. These schools were aimed at preparing women to conduct household. The idea was adopted both in Europe and overseas. Polish Village Housewives’ Circles also rose from this movement. In 1911 the Boehms were forced to sell the property and moved to Konigsberg. The reason for the decision was Otto’s illness. However, this did not slow Elisabet’s activity. With her own funds she set up a foundation, which opened a school for housewives and village women in one of the districts of Königsberg (Princess Cecilia School in Koenigsberg-Metgethen). The times in which Mrs. Boehm worked were quite difficult for women. In the social sense they were in fact just an addition to the man. All that was expected from them (simplifying of course) was diligence, good manners and the ability to give birth to the successor/heir. The Village Women’s Union made a bee their sign. It was not only that it was a symbol of what was required of a village woman to be like (work like a busy honey bee). Also because the Union systematically tried to change the mentality of women. So that from the docile and passive (not to say even mindless) robots working on farms, they would become conscious companions of their husbands. From today’s point of view – nothing extraordinary. But then it was almost a revolution! And this “revolution” was recognized in 1913. Elisabeth was awarded silver medal by Her Imperial Majesty – Augusta Victoria during the imperial visit in Königsberg ( Her Imperial Majesty came to visit one of the Boehm schools). The “work at the foundations” done by the former owner of Garbno was acknowledged and appreciated. In 1920 Departments for Practical Training of Village Women were established within the Governmental Boards of Agriculture . In 1929 Elisabet Boehm received Honorary Doctorate from the University of Königsberg and an honorary citizenship of the city. She died in 1943 in Halle. In 1998 a plaque dedicated to his exceptional woman was placed on the wall of the Garbno manor. Elisabet Boehm was not only clever and wise but also beautiful. Well … In 1911, it was acquired by Erich Schultz-Fademrecht. He was a famous breeder of military and agriculture horses. He ran the farm until January 1945, being also the last mayor of the village. And then in 1945 the Russian front came, or rather hailed down on this land, and… again new times stroke. Is this the last curve of the history for this place? Otto Boehm, was a brother of my grandfather (Julius Boehm), born May 14th, 1855 Glaubitten. He died April 1st 1921 Königsberg i. Pr. I am a member of the Boehm family. the correct spelling is Elisabet Boehm, she grew up at Liekeim estate (Rittergut) (today Nalikajmy, a few km north of Bartoszyce) Her father bought this estate in 1862. She was born September 27th, 1859 at an estate in the Rastenburg community (Amt Rastenburg) which was leased by her father. Thank you for your article. The explanation of the name Lamgarben was very interesting. He died April 1st 1921 Königsberg i. Pr. Gerhard Boehm – I would also love more information on Elisabet. She was my 1st cousin 3x removed. Her father, Heinrich Steppuhn was the son of my 3rd great grandfather. Do you know her mother’s name? Any other information on Heinrich (birthdate and death date) and also her husband Otto? Her Husband was (acc. my resources) Hermann Julius Steppuhn. I came across this page when I was researching Elisabet Steppuhn Boehm, she was my 1st cousin 3x removed on my father’s side. I would love to include your story on my Ancestry.com website, with your permission of course. Such great information here! I will gladly put it on my blog. Thank you for posting !! It’s in Polish but I opened it up in Google Translate and it does a wonderful job of turning it into English or whatever language you need.